Shock: As dinosaurs begin to prey upon the street it is clear Tim had created a time machine, and taken his whole neighbourhood with him to prehistoric times. Now with the machine in pieces there is no escape. 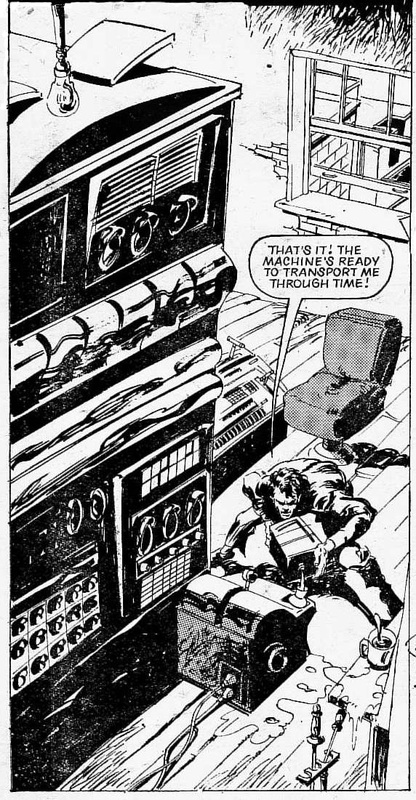 Thoughts: Martin Lock so enjoyed writing his Future Shock Time Past (prog 42) that he has repeated the exact same strip here. Where Time Past had death by Neanderthal here we get Dinosaur despatch; where Time Past had a lack of a power socket, here we have an inventor destroying the machine under misapprehension of its failure – although presumably his flat is now off the power grid too. As with his two previous Shocks the very brief tale is well told but it is slightly cheeky to have recycled the exact same idea so quickly. Ramon Sola brings his excellent dinosaur drawing skills from Flesh to this enjoyable tale and the final scene of the modern terrace street being destroyed by several prehistoric beasts is a marvellous panel. Shock’d? Lock certainly had a flair for these short one-panel reveal Shocks and this is no exception. The misdirection of a street shot after the time machine has operated but before the dinosaurs arrive nicely sets up the reader for believing that the shock isn’t going to be a ‘successful’ trip before then delivering the whole street to its bloody fate.